When GNR season started this time I had two bits of unfinished business I wanted to take care of. Fortunately, somebody beat me to one of them-- nominating Kuma’s, to make up for my part in torpedoing it a few rounds back (not that I think I was wrong then... just that I think it's deserving now). So that leaves me free to take care of the other: nominate Khan BBQ at long last. Before I loved Khan BBQ the restaurant, I loved Khan BBQ the LTHForum thread. Starting with a brief but notably enthusiastic recommendation from Zim, the thread snaked through such random subjects as where to watch the cricket championships, eating horsemeat, what a dhaba feels like, and how to motivate people on LTHForum to try a place, but most of all it vividly conjured up the Khan BBQ experience as it existed then, laminate benches from a 70s fast food joint, Pakistani TV blaring, regular customers wondering who the hell the gringos were, the tiny kitchen pumping out smoke as it produced delectable grilled meats over real charcoal flame, which meant that if it was summer, it was about 140 degrees in there, and if it was winter, the door was open so that 10 below air could catch you from behind as you ate your steaming food. I started to clip some quotes from it, but really, read the thread, it’s such a great example of how our community circles around a subject, tossing out new things, people contributing stuff I’d never know in a million years otherwise. You’ll see why it’s one of my favorite threads ever. Now, one of the things that bugged me in earlier rounds of the Great Neighborhood Restaurant program was that, despite our obvious enthusiasm for Devon as one of the city’s great food streets, we’d never managed to award a GNR to an Indian restaurant. I knew that as long as I personally stuck to the buffets-- which is hard not to do when you’re dining alone, given Devon’s typically enormous portion sizes, unless you’re willing to eat a lot of a single dish-- no place jumped out at me as extraordinary, and besides, nominating the likes of Indian Garden, solid as it is, hardly seemed up to LTHForum standards of adventurousness. But as our community explored Khan BBQ’s menu, as I ate several multiple-person, multiple-dish lunches there, Khan finally became the restaurant that rose above the others for me, and as we started to plan last summer’s round of awards, I was sure Khan would be my nominee and give Devon and Indian food the representation it deserved at last. Great food, culture-shock atmosphere (or as I said then, “Khan BBQ may have about the best ratio of crappy decor to outstanding food in the city”), Khan was a natural GNR candidate. Tragedy. I had eaten there a couple of days before with my older son. Cathy had posted empathetically about Mr. Khan working 12 hour days and hardly seeing his kids. Myles and I drove by the trashed, ashen interior and felt for Mr. Khan, for his pursuit of the America dream gone up in smoke, for the lunches I wouldn’t get to have-- and for the nomination for an award which I obviously wasn’t going to make now. Our sadness was recorded in real time, in the thread. And so, too, was our joy when Khan BBQ announced it would reopen in the improbably posh former Jewel of India space, on the much more high profile corner of Devon and Western. But would it be our Khan BBQ, if it was actually pleasant to sit in and not a jarring transcultural-displacement experience? Well, it’s different, and yet in many ways the posher, more professional Khan still has that teeming dhaba feel, the staff may wear white shirts and black bowties but there’s still something random and chaotic about the service, about the people milling about, about Mr. Khan holding court with an old friend or two at the center table. And the great thing was, with the attention we’d paid to it, with the anticipation of its return chronicled day by day on LTHForum, even without a Great Neighborhood Restaurant award we’d succeeded in turning the local foodie spotlight on Khan BBQ in time for its triumphant return. Mike Nagrant wrote about Mr. Khan in New City, I think Mike Sula did too for the Reader but I can't find it, while others did capsule reviews the old place likely would never have enjoyed without our relentless chronicling of meal after meal there. When I got to the new Khan BBQ, Mr. Khan told me that his business had doubled, and while I’m sure location and improved setting are a large part of that, it’s also obvious any time you visit that we gringos are a much more common sight than we were two years ago when LTHers first ventured en masse inside that dingy, dissonant storefront. People who would be dining at Tiffin or Hema’s are eating at Khan BBQ instead, because we got the word out to people who got the word out. If that isn’t an accomplishment to make RST proud, I don’t know what is. And so, anticlimax though it is in some sense, certainly no longer the first Indian food to make the list (Shan beat it), I am pleased to finally have the chance to nominate Khan BBQ as a Great Neighborhood Restaurant. When you’re ready to leave the comfort of the Indian buffets behind, go to Khan BBQ and experience roasted meats like chicken boti, tandoori cham, frontier chicken or goat chaap fresh off live charcoal, sizzling one way with char and another way with mind-expandingly pungent spices. So thanks to everyone who made this nomination possible-- everyone in that great thread, everyone I've ever had lunch with there, and above all to Mr. Amjad Khan for not giving up on his dream. The other day someone posted that he was expanding into the space next door to handle the growing business. Good work, everybody! Last edited by Mike G on October 14th, 2007, 5:44 pm, edited 1 time in total. As Mike said, only the cruel winds of fate have prevented Kahn BBQ from being nominated before. Mising from his list of great dishes is the outstanding broasted chicken, which, along with the chicken boti, has me addicted. I'm happy to second this nomination. Just looking at those pictures is making me hungry. Khan has become one of my very favorite, "go-to" places. I cannot think of a more worthy nominee, especially because I first learned about Khan BBQ by reading about it here, in the forums. I too, heartily endorse this nomination. I believe an "amen!" is in order. And so hereby add one! One of the things that really seals the deal for me with Khan is not only how it has resonated with LTHers, but how it resonates with non-LTHers. My wife, who is rarely in the mood for stark, ambiance-free Pakistani restaurants, swoons for Khan's. Friends who I have brought there, from Chicago and beyond, consistently bring up Khan's, how much they loved the food, how they can't quite find a place just like it, and how they can't wait to return. Devon Ave. has never had a GNR (not even a nomination, if I recall), mainly because there hasn't been one place that hits the right note for our community. I think we've finally found one. All the more reason to finally represent this meaning of "Devon." Yes, I was speaking in more terms of West Rogers Park (or West Ridge in modern parlance). Even since moving to the more post western address, I continue to have bizarre encounters and communications with Mr Khan's staff, which I consider part of the charm. In case anyone is interested in experiencing Khan first-hand, a few of us will be meeting at Khan for lunch this coming Tuesday at 12:30. I hope you'll join in. A big YES for Kahn's. I find myself craving it whenever I can't have it, like when I'm working out of town. That, in my opinion is why they're called Great Neighborhood Restaurants. That "I need it gotta have it now or I"ll pout" thing. When I was working in Dublin recently aka the Ilse of the underseasoned and overcooked, I literally dreamt of Chicken Boti a couple of times. I'll throw in my comments for Khan's - I've probably been to Khan's about 6 times or so in the past, say, 18 months or so. Each time I've ordered the Chicken Boti (spicy), Naan (garlic or onion), and rice. Now, I really like the Chicken Boti and Khan's is my go to for Middle-Eastern take-out and will continue to be. But, I gotta say, I find my standard order to be a bit pricey. This may not be exact, but since I get almost the exact same order every time it's gotta be close, but I seem to give them a $20 bill each time and get a few dollars back. So, I seem to remember my standard meal costing around $15 to $17 after giving them a buck or two for tip. I gotta say, for what you get, I find this about $5-$6 too pricey. Now, don't get me wrong, I really like Khan's. 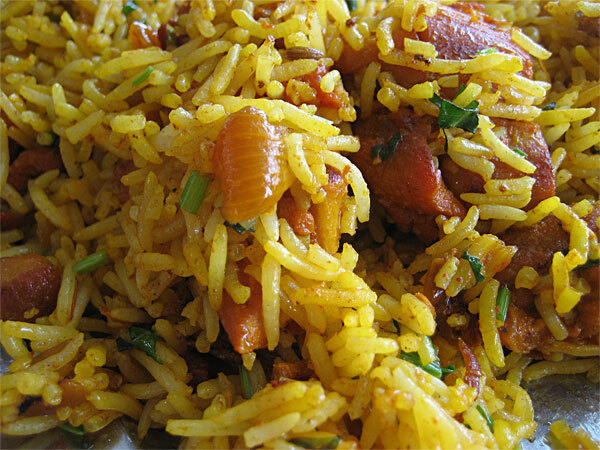 I really like the Chicken Boti, their rice is pretty good and their Naan is serviceable, not great. Thus, for me, while Khan's certainly meets the Neighborhood criteria, has "good" food and is a wonderful LTH find, in my mind at least, Khan's falls short of a GNR. 25%-30%, or top-third, of places discussed on LTH but clearly, for me, not in the Top 5%, where the GNR places belong. I must say, though Khan's is my favorite of the places up on/near Devon, I don't see a huge chasm of difference say between Khan's and a few other places up there. You can get pretty damned good chicken, fairly similarly prepared, and soemtimes better-priced at at least a few other places in the Devon 'hood. To be fair, it doesn't help things that it takes me 10 minutes to get there and 15 minutes to find parking - this pisses me off immensely. But, I tried my best to disassociate this obstacle when reviewing my experiences at Khan's. I know I'm gonna get killed for this one, ready the arrows! Thus, for me, while Khan's certainly meets the Neighborhood criteria, has "good" food and is a wonderful LTH find, in my mind at least, Khan's falls short of a GNR. I've officially been replaced as GNR curmudgeon! Seriously, I admire the rigorousness of your criteria, I think sometimes we've been a little too breezy about voting places in, but Khan is definitely in my top 5%. As far as price goes, I slightly disagree only in that I always come home with leftovers from a meal like that, even if it cost a little more up front, so it's in the under-$10-for-lunch range for me. Even an LTHForum lunch, where far too much of everything is typically ordered, still seems reasonably priced to me. Ask yourself what else you can do and get change back from your $20 that's as wonderful? I've asked this question to myself many times, and this is one of my main concerns about Khan's - What could I do with $20 and get a couple of bucks back instead that I would enjoy more or as much and maybe even cost less and get more food? 10 is enough to make my point, without getting us too far off-topic, but I can think of 10 more very easily most within a reasonable distance from Khan's. Perhaps, but I think it'd be a stronger one if there were any Indo-Pak places on that list. Some cuisines, when well-prepared, are simply more expensive than others, and I'm informed (perhaps correctly, perhaps not) that Indian isn't predisposed to being made cheaply. I hear ya on the other Indian/Pakistani places but I don't remember the names necessarily...sometimes when I go up there and don't hit Khan's I just go into one or two places and sit down and eat without really paying attention to the name of the place - I kinda like doing that a few times a year. I also kinda like the rug store up there - one day I'll actually purchase one, or two. One of the things I should have revealed about Indian/Pakistani food is that I spent a school year in London, which outside of India or Pakistan probably has the best Indian/Pakistani food in the world bar none what with all the ex-pats and fabulous places located throughout London but especially in the East End. Much like Texas BBQ/Smoke/Grilled Style ribs, any Indian/Pakistani food you can get in Chicago, even the best place in Chicago, pales in comparison for me to even a run-of-the-mill place in London, or a similarly locally undistinguished rib-shack in Texas. 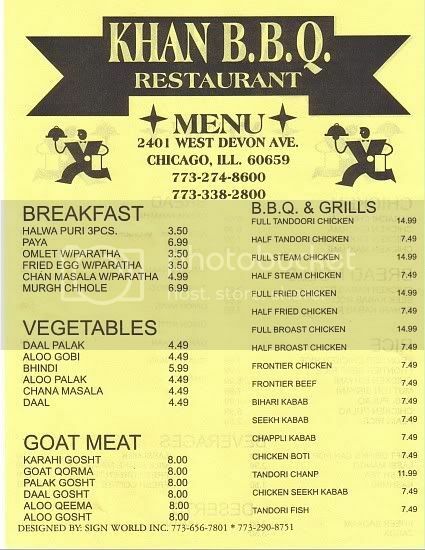 There are very, very few styles and ethnic varieties of food with which Chicago cannot compete against the rest of the World - Indian/Paskitani food and BBQ/Texas Style ribs are two of them. I cannot help but think this colors my judgment a bit. Last edited by Bster on September 7th, 2007, 2:13 pm, edited 1 time in total. So it's the price issue that stops you from enjoying fully? I could see that if we were talking $50-100 a head, but for $20 with leftovers? My hedonistic nature has a hard time rapping my hedonistic mind around that one. As was more or less said above, I think Khan is a great value for 2 or more diners. Maybe for a solo diner, that's not quite the case. But even on a solo basis, we're still not talking about a vast difference in total cost per meal over some of LTHForum's other beloved options (or the list above). And almost certainly, if one person were to order 3 items at Khan, there'd be leftovers (excluding myself here ). Beyond that, restaurants in a variety of price ranges populate the list of GNR recipients, so I'm not sure price really matters except in how a GNR nominee's pricing relates to the pricing of other restaurants of the same genre. No offense, but rice and naan is slightly overkill. But, in any case, are you also including a drink? Because my standard order is meat + naan, and the total is always <$10 (maybe over $10 after tip, I don't recall). Anyone have a current menu? Though I do agree with you that price should not be neglected in GNR considerations. I just think in this case, the price is quite reasonable. I could pay double my bill every time at Khan and still love it just as much. Heck, I'd pay a monthly membership fee just to be allowed in the front door for the right to pay them to cook for me. I tend to be the first person to complain about restaurant prices, but I personally find a $20 tab (but usually less) perfectly reasonable when shared with at least one other diner at Khan. For a look at past menu prices, check out the options listed on MenuPages.com. A menu I took out earlier this year shows prices a bit higher than those listed -- whether by a quarter or two bucks -- but we oughtta be able to confirm current costs when we visit on Tuesday (the 11th). It seems to me that Khan's probably is best when dining with two or more in your party. Plus, I like Khan's and sometimes really like it so I think my ire belongs elsewhere. Plus, if there is another nominee up for a GNR this time around that has more consensus from the Board, I haven't seen it. So, my points are moot. I'll bring the GF next time around and see what that does for me. Bster wrote: I'll bring the GF next time around and see what that does for me. 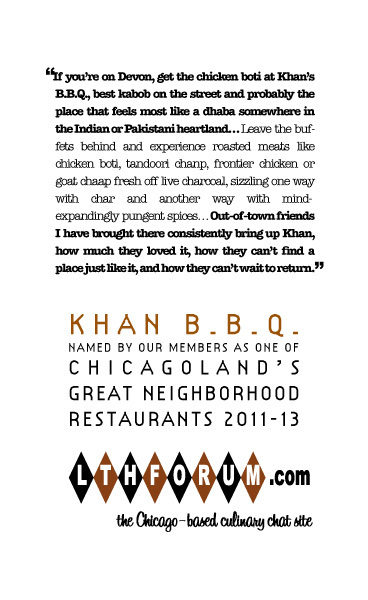 Khan is a favorite, a shoo in GNR, a Chicago gem, a place where I take mildly jaded food centric friends to wow them. Price wise, I've had countless uninspiring trough food in the guise of chef-driven $25 per person and up (way up) meals, when a platter of charcoal tandor charred chicken boti approaches my table I start to forget, one bite and thoughts of overcooked duck breast with sugar coated hucksterberries are gone. I'm with Morowitz, I'd pay a monthly fee to Mr. Khan. If the girl friend can't go email or PM me, I'll tell you the rest of the joke. We first learned about Khan BBQ from LTHforum. After our initial visit we sat back, food grins on faces, and wondered how the hell we hadn't been eating there for years. I don't see how it's even theoretically possible to improve on several of their chicken dishes. They should get a RFGNR (ridiculously f*cking great neighborhood restaurant). G Wiv wrote: one bite and thoughts of overcooked duck breast with sugar coated hucksterberries are gone. Hucksterberries? Good one! Can I steal that? Last edited by d4v3 on September 17th, 2007, 9:49 am, edited 1 time in total. Bster wrote: I hear ya on the other Indian/Pakistani places but I don't remember the names necessarily...sometimes when I go up there and don't hit Khan's I just go into one or two places and sit down and eat without really paying attention to the name of the place - I kinda like doing that a few times a year. I also kinda like the rug store up there - one day I'll actually purchase one, or two. Wow, couldn't disagree more. I've been to Pakistan dozens of time throughout my life, and there are many places in Chicago that match or even exceed eating in Lahore, Karachi, Multan, Islamabad or Pindi. 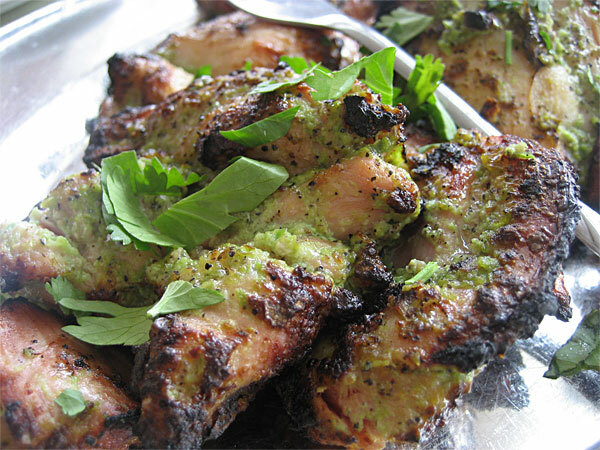 Khan's a fantastic GNR nominee, the best grilled meats on Devon and a few transcendent dishes. fastfoodsnob wrote: ...For a look at past menu prices, check out the options listed on MenuPages.com. A menu I took out earlier this year shows prices a bit higher than those listed -- whether by a quarter or two bucks -- but we oughtta be able to confirm current costs when we visit on Tuesday (the 11th). Hope that makes budgeting a trip to Khan even easier for y'all! I should throw in, here - though I've tried to go back several times and just haven't made it, the LTH lunch at Khan's was an eye-opener for me. For one thing, although this may be a negative for some folks, it was nice to have food ordered at the "spicy" level well tolerated by my admittedly wussy palate. My problem I often have with food from this region is that I crave highly-seasoned and flavorful food, but ordering something "mild" often means it's bland, bland, bland. Not so here at Khan's - the spice levels are just right: everything hits you in the mouth hard wth a lot of flavor and seasoning, without the eye-singeing heat buildup I dislike at Southern Indian places. 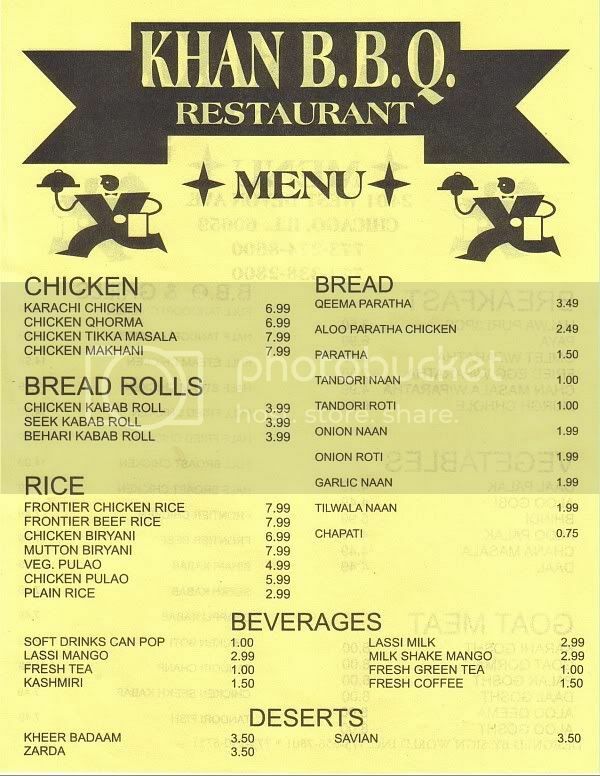 My favorites were the moist Chicken Bhoti and the crispy Broasted Chicken, both addictive and I can't wait to get back. And I thought the price was right-on, especially considering the huge amount of food you get for the money. GNR away! I'll second, or third, or 18th, or whatever, Khan's. I'd never been there prior to the lunch Ronnie organized, but the broasted chicken was amazing. Definite GNR.